The World's Largest Menorah is NOT in NYC?!? Despite what Chabad and the City of New York may claim, it appears that the largest menorah in the world is neither the 32 foot high one to be lit in Grand Army Plaza in Brooklyn (pictured above), nor the one designed by Yaacov Agam that will be lit on Fifth Avenue (apparently also known as "Grand Army Plaza," terribly confusing to all Brooklynites, pictured to the right), beginning December 20th, 2011. I'm shocked too. I mean, Chabad even owns the webpage "www.largestmenorah.com." No, as reported in the New York Times just over a year ago, the world's largest menorah is in...Indonesia! Indonesia? Where Judaism isn't even an officially recognized religion? Where, during World War II, Jews were scapegoated and placed in concentration camps by the Japanese? Where Jews were killed or forced to leave after World War II and during the 1950s? Didn't all the rest emigrate? Aren't there only, like, 20 Jews left in all of Indonesia? I mean, Israel and Indonesia don't even have diplomatic relations! And yet...yes, Indonesia! 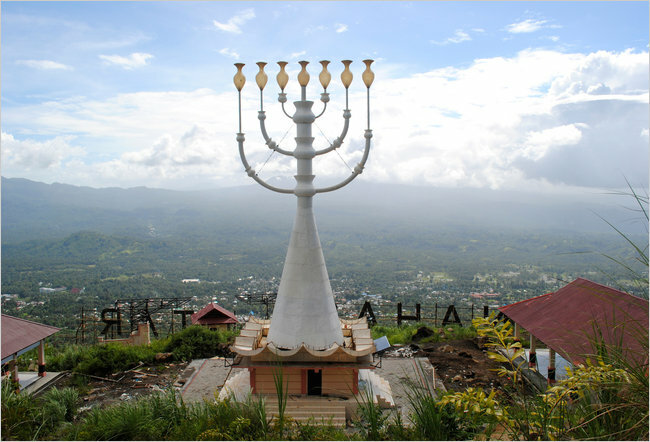 As described in a New York Times article from November, 2010, Manado, the second largest city in Sulawesi, is home not only to the fourth-tallest statue of Jesus in the world, but also to a 62 foot tall menorah. According to the article by Norimitsu Onishi, the menorah was erected at the cost of $150,000 by the government of this largely Christian region. The Jakarta Globe reports that the menorah was the brainchild of Denny Wowiling, a local legislator who "proposed building the menorah after learning about the one in front of Israel's Knesset," in the hopes that it would help attract European tourists and business. For more about Manado's small Jewish community, check out this article from Jewish Times Asia (where according to the website, as I post this, it is already tomorrow - neat! ), this one from "Vos Iz Neias?" (a rather bizarre site, but the article has terrific photos), or best of all, this video about Indonesia's Jewish Micro-Minority from the VJ movement. Happy Chanukah! There's so much good stuff going on right now to help Jewish boys and girls grow up with a sense of self-confidence -- and one that isn't predicated on gender stereotypes. But what do you do when your child's teacher didn't grow up attending Moving Traditions programs, hasn't been to a training on the "evaded curriculum" and doesn't even realize that Jewish chicks rock? "I wanted to share with you the email below that I wrote to my daughter's school administrators. Not in response to any incident or specific concern I had about the school, but rather in response to my ongoing fear/concern about raising strong, healthy girls with high self-esteem and confidence - and my concern about raising boys who see their full range of humanity open to them, rather than a narrow view of what 'masculine' means. "To give extra motivation - I sent this to our school, not knowing what response I would get. They took it up very seriously and appreciatively, spending 3.5 hours today on a professional development workshop for faculty and administrative leaders on the topic. "If you're in NYC - I actually designed and facilitated the workshop! And I'd be happy to bring it to your school, also. "Here's to building a world where both girls and boys see a broader range of possibilities!" I never fail to notice how often someone limits my daughter's choices - at the doctor's office, when they say "Do you want princess stickers?" At the arts shop, when they say "Do you want pink paint?" I recently saw a couple of articles that made me think more about how gender is "taught" (formally/consciously and unconsciously) to children, which prompted me to write this email. Do the teachers react with as much excitement when girls build a tower with blocks ("Look at how tall/complex that tower is!!!!!!!!!") as when they dress up as Snow White ("You look so beautiful!!!!!!!!!")? Similarly around holidays - Because there are so many more men in the stories and holidays, are teachers/administrators going out of their way to bring women's stories and women's voices in? Is Esther viewed as a critical protagonist or as a confused and scared accomplice to Mordechai? Are figures like Deborah brought in to the curriculum? Is Miriam highlighted as a critical player in the Pesach story as well as Moses? Are Ushpizot invited into the sukkah, in addition to the traditional group of Ushpizin? Are girls encouraged towards math and science as much as boys are? Are teachers aware - or do administrators who observe point out - any subtle differences in ways that teachers interact with boys and girls? What ongoing professional development and ongoing feedback is included/provided for faculty - especially those who may have grown up in communities where girls and boys were not given the same opportunities? I'm hoping that school can be a place where my daughter's options are kept as open as possible - which is only possible if her teachers have an awareness of these types of things and how limiting they can be. Especially since many other children will be perpetuating gender stereotypes with their words and actions, I'm hoping that the teachers will help keep open the windows to opportunity. These windows of opportunity are, of course, also important for the boys. There's a world and palette that our society tries to limit boys to, also. These articles that I read not only comment on what teachers say and what they encourage, they also comment on what is included in classrooms. For example, perhaps the preschool classrooms do not need to have high heeled shoes for the kids to dress up in. As I've watched the girls having to walk gingerly around the classroom, I've wondered, "Is 3 years old really the age at which we want to impede our girls' movement in this way? We don't have shoe-dress-up for police officers or firefighters or chefs. Maybe dressing up the body but not the feet is good enough for a princess, also." 1. How to Talk to Little Girls, by Lisa Bloom (Huffington Post). "This piece resonated a lot with me because I've been struck how waiting in the morning for school to start, almost every parent says to each girl as she arrives, 'Hi! I love your dress/hair/shoes/coat/etc.' I've been bothered, but couldn't quite articulate it to myself. This does a great job." 2. Taking a Stand Against the Princess Culture, by Susan Tomchin (Jewish Woman Magazine). "An interview with Peggy Orenstein, author of Cinderella Ate My Daughter. This made me think about how girls are dressing up, how Talia's already asking me to wear nail polish (because she sees other girls wearing it), etc. and helped paint a broader context for all of that." 3. The film Miss Representation. "This film focuses on media and advertising - I think it's a really important film." Do you have suggestions of other resources and must-reads? Post them in the comments. "Applications are now being accepted for a Jewish educator with an ability to think outside the box to lead a cutting-edge complementary Jewish education program based in Manhattan for children in grades 3-7. "The Jewish Journey Project (JJP) seeks to revolutionize supplementary Jewish education for children. JJP catalyzes collaborations between congregations and JCC’s to create customized learning journeys for every student based on their interests and passions. JJP’s educational design is experiential and oriented to address the whole child, applying the wisdom of the Jewish heritage to the social, emotional and intellectual growth of each and every student. Families are deeply involved in the JJP process as they help to customize their children’s learning journey in consultation with advisors who serve as the liaison between families and member institutions. Most importantly, in JJP the entire community becomes a living classroom and, as a result, a breeding ground for lifelong Jewish engagement. "The Jewish Journey Project was launched in the winter of 2010 based a concept paper written by Rabbi Joy Levitt, the executive director of the JCC in Manhattan. Currently, six synagogues spanning the denominational spectrum and two JCCs are participating in a year-long planning process to develop this new model for elementary Jewish education. The program will launch as a consortium in the fall of 2012. The position is available commencing March 2012 with the immediate tasks being the hiring of a faculty, the marketing of a new program and working closely with our partner institutions to meet their respective needs. "Candidates should have at least an MA in the field of Jewish education or the equivalent. They should have experience in both formal and informal Jewish educational settings. The position will require strong management skills (e.g., budgeting, putting new systems in place, communications strategy, hiring and supervising personnel, scheduling,) as well as leadership savvy (e.g. inspiring faculty, raising the bar of what is currently acceptable in the realm of Jewish education, working with funders, Jewish communal professionals, parents and their children). Previous experience in running a school would be most valued though we will consider candidates with a less conventional background. "Interested candidates should send in a resume, a letter explaining their interest in and suitability for the position and their salary expectations to Rabbi Sid Schwarz, project director for the Jewish Journey Project at dokrent@jccmanhattan.org." If this is the first time you're hearing of the Jewish Journey Project, you might want to read Joy Levitt's editorial or Julie Weiner's article in Jewish Week. We at Emanu-El have been involved in the planning process for over a year, so feel free to be in touch with me directly if you are curious about this initiative or my thoughts on the position. Should Religious School be Cancelled on Halloween? This year October 31st, a/k/a Halloween, falls on a Monday. This poses a unique challenge for religious schools. Unlike Thanksgiving or New Year's Day, Halloween is not a national holiday, and secular schools do not close. Yet, practically speaking, for many children in the United States, the afternoon of the 31st is meant for trick-or-treating - exactly the time-slot when religious school is in session. And when I say "many," I think back to the last time that Halloween fell on a day when our school was in session. Out of 75 students, exactly six showed up. One kid brought his mom, and I overheard him telling her, "You see, I TOLD you I would be the only fifth grader here!" So this leaves religious school principals in a complicated position. On the one hand, it is hard to rationalize closing school for a non-Jewish holiday (I'll say here, parenthetically, that although some Jewish schools and teshuvot take a strong stance against Jews participating in any non-Jewish celebrations, I find unconvincing the arguments that Halloween is a "Christian" or "pagan" celebration. 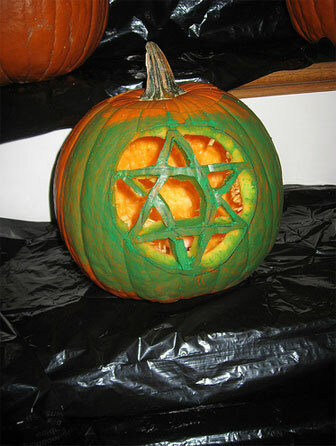 True, it has pagan roots, but so do many Jewish holidays and rituals. There are indeed Celtic neopagans celebrating Samhain on October 31, but that's not really the issue here. And, we aren't talking about cancelling school on November 1, "All Saint's Day," but on "All Hallow's Eve," the night before; Halloween can be confusing and problematic for Christians too). On the other hand, how do we ignore the reality that many of the kids will skip school, and that this will impact the experience of the ones who do attend? Do we take a public stance on whether or not it is okay for kids who do attend - and faculty - to come in costume? So what to do? I know of several schools that close for the day and instead run an in-service for their faculty. This is a sensible response, and consistent with how some schools handle other holidays, such as Veteran's Day or Martin Luther King, Jr. Day. Other schools allow for, or even informally encourage, early dismissal - a sort of compromise approach. Still others offer special programming on the day, meant to entice students to view school as both a worthwhile alternative to trick-or-treating and to feel rewarded for their attendance. 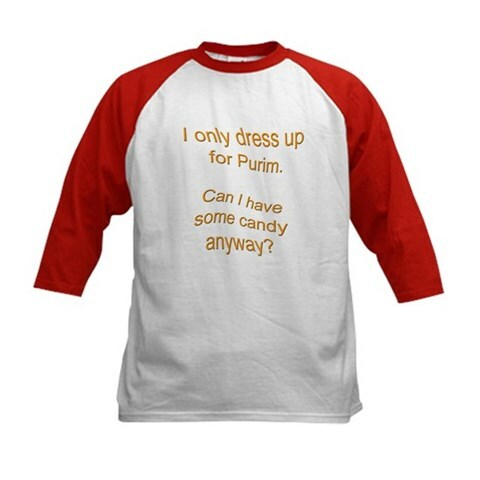 One school I know offered a program on demons, ghosts and witchcraft in Judaism; another ran "Purim in October." We are in the fortunate position at Congregation Emanu-El of running a one-day a week school that offers classes on Sundays as well as weekday afternoons. We have a general policy of encouraging students who are unable to attend on their usual day of school to attend on the other day. In fact, we've had students who regularly alternate between Sunday and weekday attendance, including children of divorced parents who have alternate custody over weekends and kids who change their day of school with the change in sports seasons. This year, we will suggest that parents whose children might miss school on the 31st should send their children on the 30th instead. I'll let you know in the comments section how this goes. This is, of course, just the first year in a new cycle of dealing with the "October Dilemma." In 2012 and 2013, when Halloween falls on a Wednesday and Thursday, it will conflict with the schedules of many religious schools. Then, in 2014, we'll turn this problem over to the clergy; they'll have to figure out how to handle attendance at All Hallow's Eve of Shabbat. In the fall of 2009, Congregation Emanu-El of the City of New York was named one of 24 “innovating congregations” in the New York area because of our dedication to educational transformation. We became a founding member of LOMED (Hebrew for “learning”), a coalition of diverse institutions from New York City, Long Island and Westchester, all committed to developing educational programs that are relevant, engaging and inspirational. During the past academic year, LOMED provided the resources for us to create a four-minute video about our seventh grade Mitzvah Corps. (View it at www.youtube.com/emanuelnyc.) LOMED also awarded us a grant supporting professional development for our faculty and experimentation with new approaches to learning. We’ve put this funding to good use: After its pilot year, our eighth grade Lirdof Tzedek (“Seeking Justice”) program was identified as a “highly effective model” recommended for replication by other synagogues. Most important, our work with LOMED has provided a framework to think deeply about the ultimate aims of our school. What is it we hope our children and their families will gain from the Religious School experience? How will it influence our community, both now and in the future? Through LOMED, we defined the purpose of Jewish education at Emanu-El: To support our families in living Jewish values. Living Jewish values means much more than remembering stories from the Bible or being able to say a prayer in Hebrew. There are far too many examples of people who are knowledgeable and perhaps even religiously observant but who somehow fail to live ethically. For our students, studying a Bible story involves investigating the dilemmas faced by our ancestors and exploring their actions, the virtuous and the shameful, the praiseworthy and the irresponsible. We ask how the decisions they made might serve as examples in our striving to be wise, just and compassionate individuals. Many ways exist for educators to talk about what we do, and as in any profession, much of it is insider jargon. LOMED provides a language with which we can articulate the goals of the school curriculum clearly and simply. Using the diagram that accompanies this article as a guide, our teachers collaborate to shape meaningful and vital learning experiences. 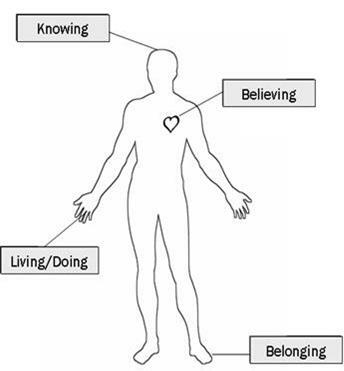 This diagram is a clever mnemonic device that highlights four dimensions of effective instruction. First, every lesson must engage and inspire the mind of the learner (the “head”). Second, the “hand” is a reminder that every learning experience must both incorporate and lead to action—perhaps a change in behavior or the development of a new skill. 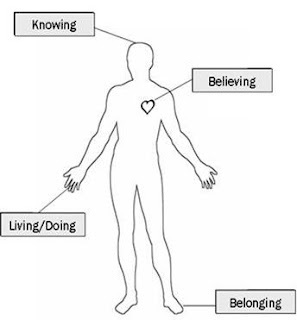 Third, we must consider the “hearts” of our learners, for in everything we teach we must ask, “Why should we care?” And finally, the “feet” remind us that effective Jewish education leads us to take a stand on our beliefs as a part of a community. This “whole person” approach ensures that our Religious School program is responsive to the genuine questions of our learners, that the learning is applicable to daily life, and that our school community is one in which our children will grow into responsible and capable Jewish adults. Each classroom is a laboratory for Jewish living in which the teachers model the thoughtfulness and mutual respect that we seek to promote in our students. The care and concern our teachers have for each child enables our students to support one another and to challenge themselves to grow as individuals, as family members and as part of an ethical Jewish community. We are fortunate to be the inheritors of ancient wisdom that guides us in living principled lives in complicated times. At Emanu-El, our students become reflective about their actions, passionate about their beliefs and kindhearted toward one another. As we strive to become the best people we can be, proud of our heritage while accepting no dogma blindly, we are prepared to join together with those of all faiths and backgrounds to build a just and virtuous society.